There’s no two ways about it. Justin Kan is a startup legend. In 2006, he launched Justin.tv, which is credited for popularizing lifestreaming. This later evolved into Twitch.tv, which Amazon bought in 2014 for an eye-watering sum. Kan is also responsible for founding SocialCam, Exec, and The Drop. But there are some pretty sizable downsides to being a well known serial-entrepreneur. “I would get tons and tons of questions, and they were often the same question. How do I learn to program? How do I start a startup? How do I find a technical co-founder?”, Kan said in a YouTube Vlog. Although undeniably annoying, this inspired his latest iOS exclusive app, called Whale. 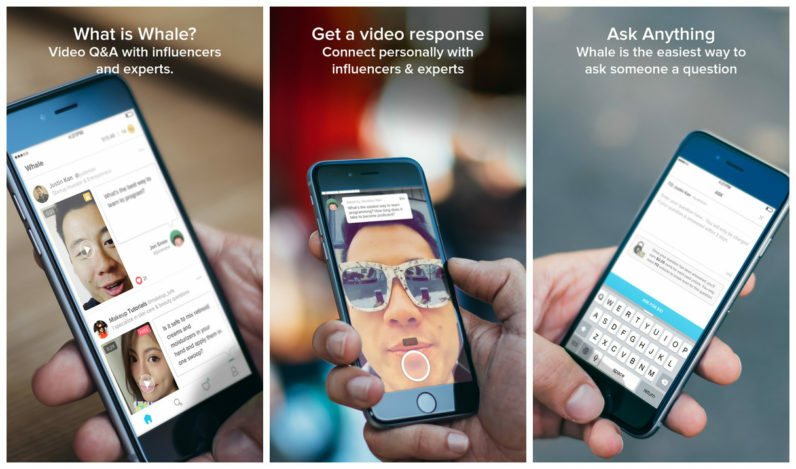 Simply put, it allows users to ask questions to influencers and experts, who then create short videos. These are then stored in a library, which can be referenced by the Whale community afterwards. This avoids the tedious repetition that Kan hates so much. Think of it as if Quora had a lovechild with Snapchat. How Whale intends to attract its community of “influencers and experts” from other platforms, like YouTube, Twitter, Facebook, and yes, Quora is especially interesting. In short, it’s going to give them the opportunity to monetize their expertise. Want to ask someone a question? You’d best whip out your credit card. It’s an interesting concept. If you want to try it out for yourself, you can download Whale from the App Store right now.